If you are in a business that sells products, the time will inevitably come when you will want to update the look of your packaging. Overtime you will learn things about your existing package that need to be changed, you will desire to modernize the feel, you will want to evolve the logo or communication, etc. Updates to packaging are perfectly natural and healthy as long as the changes do not erode your consumer base. Frequent changes are unhealthy since it destroys your brand equity. What is brand equity? In the world of accounting, it is considered an intangible asset which is quantified to add value to a companies assets. In marketing, it can be defined as the awareness or recognition of a brand. The stronger the equity of a brand, the more recognizable it is. With that in mind, brand equity is a function of the things that help consumers to recognize the brand. Let’s look at Goldfish by Pepperidge Farm as an example. 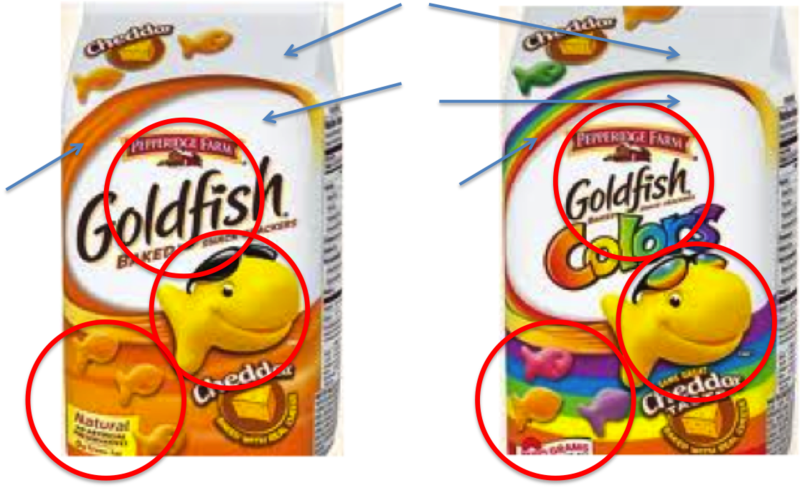 On the packaging examples below, you will see the original Goldfish Cheddar and a line extension – Goldfish Colors. I’ve circled in red and pointed to in blue the significant points of recognition on this package that contribute to the brand equity. I’m classifying these as the consistent factors that significantly contribute to the brand equity. If Goldfish were to redesign their packaging, maintaining these 5 characteristics in the above would be a must and changing any of the five would result in severe risk to the equity that the brand has developed. Another packaging component that you will want to consider is the ranking of the messaging that you want to communicate. Typically a consumer makes an impulsive purchase decision within 2-3 seconds of looking at a product. You may have 5 things that you want to communicate on your product, but in reality, only 1-2 of these will be seen within this 2-3 second window. Therefore, you need to prioritize the messaging and the placement of the messaging to get your points of difference or product benefits across. If you attempt to communicate too much, the package will look too busy and the messaging will be lost. The most prominent messaging is that this is made with Fruits and Vegetables. This is right in the center of the package and arguably communicated twice through the branding and the identity. The second most prominent message is the flavor, since this is second largest and takes up quite a bit of real estate on pack. I’m sure that the brand team did some decision tree mapping to determine how consumers shop. 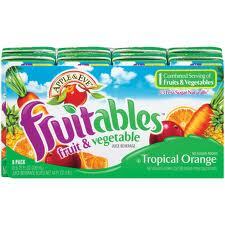 In this case, it appears that consumers first shop by positioning (fruit and vegetable beverage) and then by flavor. Lastly, the product benefit of 1 combined serving of fruits and vegetables is the third thing that pick up on since it is not as large and has more fine print. What packaging related questions do you have?